Standing behind a field mottled with sprouts of crimson clover at Matsuda Farm last week, Caitlin Ames guided a hose over dozens of neatly arranged plant starts that will soon yield fresh produce for sale to the Vashon Maury Community Food Bank and Vashon Fresh online food marketplace, which launched last June. Rolling acres once emblazoned with ripe strawberries were earmarked for a new era of planting when the Land Trust bought the property in 2015, but after proposing to lease the land for farming, they reversed course, opting to reach development milestones at the farm themselves. Ames, a Vashon Island Growers Association board member who joined the Land Trust in 2016, said that the trust’s autonomy allows it to form valuable partnerships on the island and to pursue the work it most wants to. 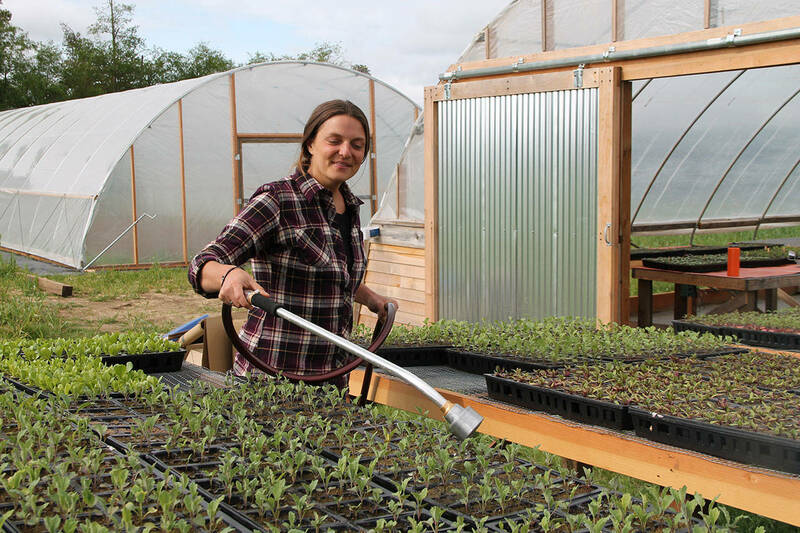 Namely, that work is a marriage between ongoing conservation at the historic Matsuda Farm homestead and community-driven agriculture that provides for Vashon and its residents. The trial crops for this growing season include kale, cucumbers, tomatoes, peppers and beets. An irrigation system has been installed. Behind Ames was a newly erected high tunnel greenhouse funded by the United States Department of Agriculture where more produce will be grown, maintained with help from four recently appointed interns who joined the trust’s stewardship program this year. The crimson clover was deliberately planted by the Land Trust to enrich the soil with nitrogen. Other cover crops such as cereal rye and vetch were planted last year to increase overall soil health, reduce erosion and control weeds. With 3 acres now designated for crops, the Land Trust can afford to spread out, and expansion is in progress. In conjunction with the school district, the Land Trust is seeking an additional grant from the USDA that would connect the island’s schools with the farm, aiding strategies that would improve the access students have to local, fresh produce. The Farm-To-School Grant from the USDA allocates more than $5 million each year to support accessibility to local, healthy foods for students across the nation. In the fall, Dean said that the Land Trust will consider choices that will allow it to boost production as it broadens the capacity of the farm. For the time being, the first pick of crops grown at Matsuda will be sold wholesale to the food bank, and the surplus to Vashon Fresh. Food bank executive director Robbie Rohr believes this approach is commensurate with the values of her organization and feels optimistic about what is to come. Ames said that proximity is one of the greatest impediments discouraging most from regularly seeking out fresh produce at farm stands and markets, especially when hectic schedules outweigh consistent, healthy alternatives. To Rohr, that matters tremendously. “The whole movement for food banks and pantries is to provide enough food for people. The whole model of our work is to try to provide nutritious food to more people,” she said. Rohr emphasized that as more people find themselves stretched thin, such burdens underscore the need for additional resourcefulness. Having worked in nonprofits for the majority of her career, Rohr added that cooperation with Matsuda Farm poses a rare opportunity to unite the primary sectors of the economy — service, manufacturing and raw material extraction — for the benefit of all islanders. Ames worked closely with the development of Vashon Fresh before it launched and remarked about how devoted she is to elevating it, and related causes, further. Ames said these contributions to the island agriculture economy have the potential of extending access to produce in ways that have not existed here before. “Contributing to that market through Matsuda, I think, is the best approach,” she said.